ARABIAN SEA --- Maritime forces from France, Australia and the United States participated in Ship Anti-Submarine Warfare Readiness and Evaluation Measurement (SHAREM) 195 exercise in the Arabian Sea, Dec. 14-18. Participating ships included French navy F70AA-class air defense destroyer FS Cassard (D 614), and Royal Australian navy Anzac-class frigate HMAS Ballarat (FFH 155), guided-missile destroyers USS Stockdale (DDG 106) and USS Spruance (DDG 111), Los Angeles-class fast-attack submarine USS Louisville (SSN 724), and Military Sealift Command dry cargo and ammunition ship USNS Richard E. Byrd (T-AKE 4). Additionally, U.S. P-3C Orion aircraft and a French Atlantique 2 maritime patrol aircraft supported the exercise from the air. The exercise put the ships through several structured events to collect data and train Sailors against a known adversary. The ships then tested their offensive prowess by tracking and prosecuting the submarine in a “freeplay” event. In the culminating event, the warships defended the supply ship, Richard E. Byrd, from a submerged threat with conducting replenishment operations. The SHAREM program focuses on developing anti-submarine warfare in the surface community by reviewing performance and tactics and recommending solutions to warfighting gaps. Task Forces 54 and 50 led segments of the exercise. TF 54 is the submarine force in the U.S. 5th Fleet area of operations, and commands operations of U.S. submarine forces and coordinates theater-wide, anti-submarine warfare matters. Their mission covers all aspects of submarine operations from effective submarine employment to safety and logistics. Stockdale and Spruance are both part of the John C. Stennis Carrier Strike Group, which serves as Task Force 50 while deployed to the U.S. 5th Fleet. 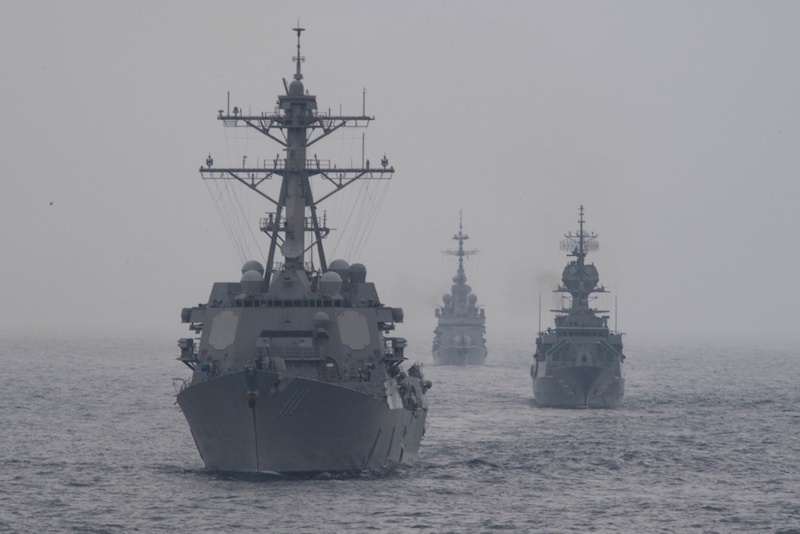 Their participation and SHAREM 195 is a part of the U.S. 5th Fleet’s theater security cooperation engagement plan to improve interoperability with partner nations, while ensuring maritime security.